Chris-zilla struck Tokyo again today. "Me hungry!" he roared. 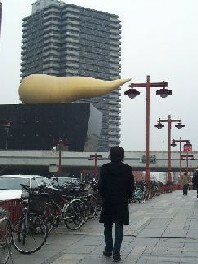 He stomped a wide swath of buildings on his way toward the famed Asahi Beer Hall, where he spied the equally famous "Big Turd-Like Thingy" atop the Asahi Beer Hall. 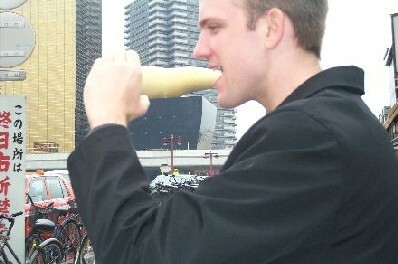 Mistaking it for a giant radioactive parsnip, Chris-zilla consumed the landmark sculpture in a single gulp, celebrating it with an ear-shattering belch registering an impressive 4.3 on the Richter scale. When last seen Chris-zilla was trying to hide behind Mt. Fuji to avoid a confrontation with Asahi's Vice President of Corporate Security, Godzilla! After repeated phone calls, Asahi's Chief Decorative Officer had this to say about the Big Turd-Like Thingy: "We have been assured by our foofy French architect that this beautiful sculpture represents the flame of triumph. It only had to be turned on it's side, turd-like, due to a minor violation of building codes." Despite repeated follow-up questions, the CDO refused to comment on any minor or major violations of basic international standards of good taste.